This is probably one of the go to Korean restaurants that I would recommend. 1. It’s really close to my house..just down the street. 2. It’s a small family restaurant, which I find really nice, they pay more attention to your needs. I love these appetizers/ side dishes, whatever you call them. Every Korean restaurant serves their own dishes, but kimchi is probably the one that is served most. 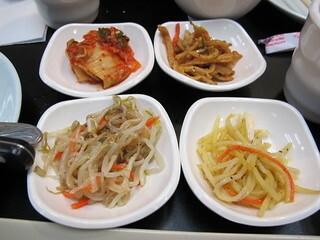 Starting from the top left corner, going clockwise: kimchi, sliced fish paste, potatoes (I think) and bean sprouts. And you can ask for more of these, that’s a bonus! Ever since my brother introduced me to this soup, I never stopped ordering it whenever I have a chance to. 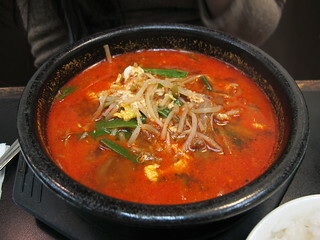 It’s called yukgaejang. It has shredded meat, glass noodles, and eggs. LOVE, LOVE LOVE. Dennis order the lunch special (I believe). 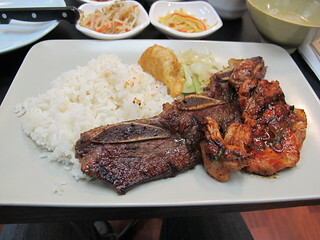 I think it’s kalbi flavoured short ribs and chicken, with rice (as you can see). It came with miso soup.